There was a time I used to say that when my kids weren’t toddlers anymore and went off to school every day, I might like to have one more baby… a little one whom I could enjoy in that low-stress way that last children are enjoyed. I no longer remember why I thought that would be a good idea. 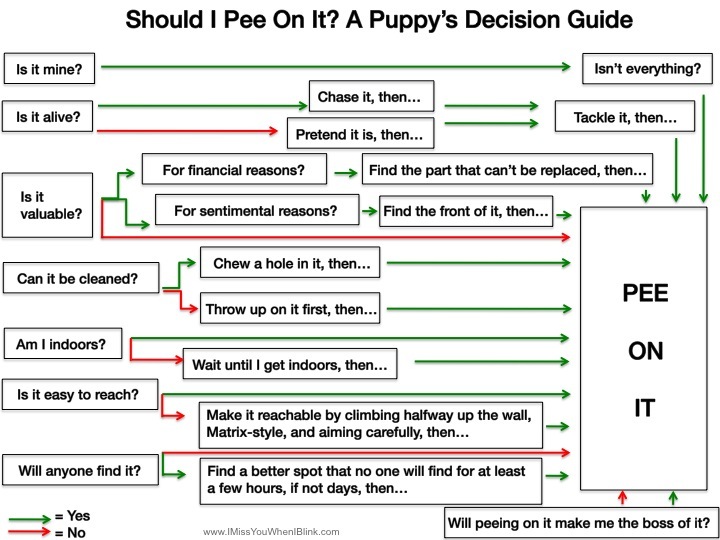 A canine baby is plenty, thankyouverymuch. Thanks! If following my pup’s lead, then anywhere. I’m not a dog person so I’m with you! I am *totally* a dog person and it’s still making me lose my mind. OMG, I suffered post-partum depression when we got our puppy. I had NO IDEA how much work it would be. Now he’s 3.5 years old, and I love him, except when he…. This is quite the cliffhanger. Brilliant! And completely true in every way!